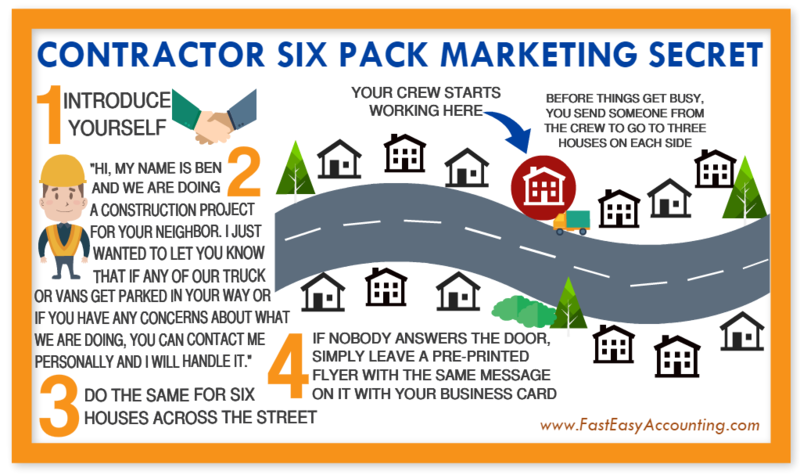 Contractor Six Pack Marketing Increases Sales And Profits! Because of all the money it can earn for you if you do it right...which means if you do it at all! Contractor Six Pack Marketing is extremely powerful so be very careful with this one...several years ago in one of our construction companies we would send a crew to do a small two or three day project and they would wind up staying in the area for several months at a time. A contractor's lead generation dream! We had to hire more workers, train them using our documented process and send them out to a new project in a new neighborhood and BANG! More often than not they would plant the flag and setup operations and be there for a very long time. Here is how it works: Your crew shows up to a house to do construction project and before things get really busy you go to three houses on each side of the place where you are working (six pack) and introduce yourself to the people living there by handing them a business card and in your own words say something like "Hello, my name is ----- and we are doing a construction project for your neighbor ------ and I just wanted to let you know that if any of our trucks or vans get parked in your way or if you have any concerns about what we are doing you can contact me personally and I will handle it." WOW! You will amaze and delight them! Now do the same for the six houses across the street and when you are finished if nobody has asked for you to "stop by and see about a construction project" at their house you re-visit them and ask if they were inconvenienced in any way. This works because most people are curious about what is going on their neighborhood. Numbers, Numbers, Numbers! In baseball if somebody hit homeruns 30% of the time they went up to bat they would earn a lot of money. Most of the time you will not find new work in the neighborhood; however, if it works just 10% of the time and one more person hires you repeat the six pack again and in most cases human nature is "Me Too, Me Too!" Nobody wants to be left out and very quickly you are getting a backache hauling all your money to the bank! Now for the big news Figure out how much money it costs to "Mobilize" get your vehicles, labor, material, tools and equipment to a jobsite and how much does it cost to "Demobilize" or reverse the process. 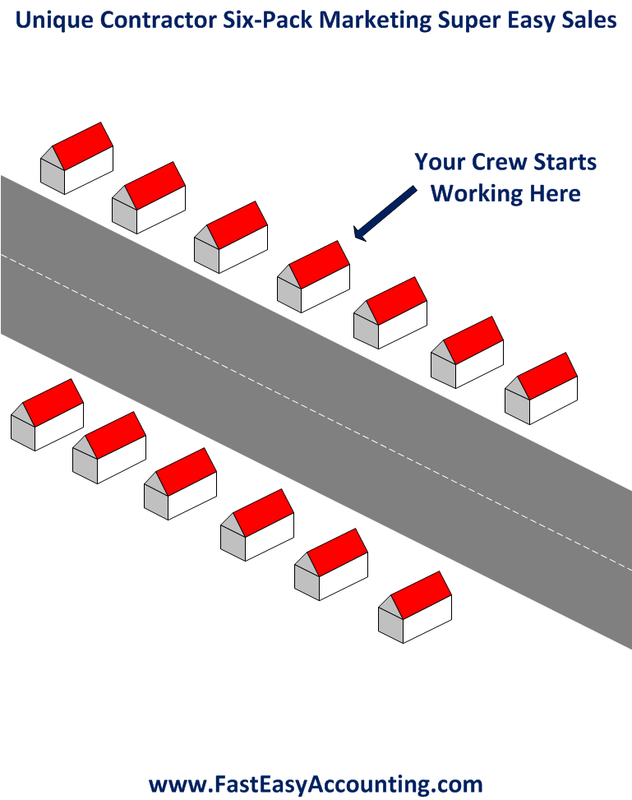 Now add an increased efficiency of at least 1% to the bottom line because the crew is familiar with the people and the neighborhood. Every time your contractor six pack works you just put that "Mobilize and Demobilize" money and the 1% increase to the bottom line in your "vacation, retirement, kids college fund or whatever makes you smile fund". If you would like to try the contractor six pack but need someone to do it with you and if you are within 20 minutes driving distance from my office in Lynnwood Washington and offer to buy me breakfast ahead of time I could be persuaded to do it with you at no additional charge other than breakfast because I always enjoy a good meal with a contractor! Contact Sharie 206-361-3950 or by email sharie@fasteasyaccounting.com and let her know you are interested in Six Pack Marketing.